For cooking lovers, finding good cooking magazine is not that easy. They have to go through several magazines to find the perfect one but don’t worry that time is over and we have become the people of app generation. We can easily use our smartphones to find best recipes and cooking guides through Recipe Manager Apps on our smartphones. 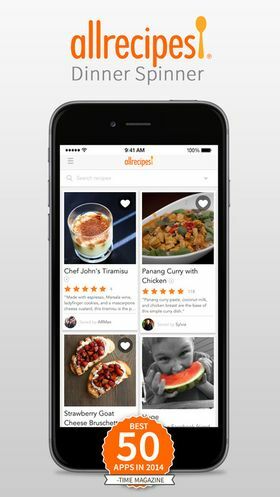 These recipe apps not only gives us the exact recipes but also allows us to connect to the worldwide group of chefs. These apps allow people to search recipes as per their requirement. Big Oven – BigOven 350,000+ Recipes and Grocery List. SideChef – Cook 2500+ step by step curated receipes. Yummly – Discover Recipe recommendations personalized just for you. 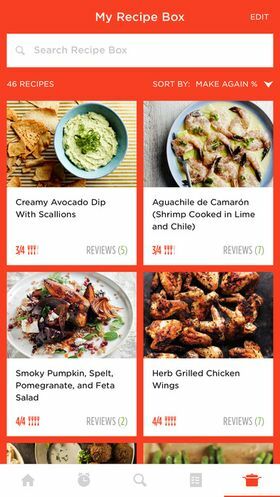 Allrecipes Dinner Spinner – Organize your favorite recipe into collections. Epicurious Recipes & Food Videos – One of the best food apps of all time. Cookpad – Chat about cooking in real time with friends and family. Healthy Vegetarian Recipes – Natural and healthy cooking with 100+ delicious vegetarian recipe. Fit Men Cook – Recipes by Kevin Curry Delicious, Practical, healthy. Forks Over Knives – Over 2000 delicious whole-food, plant-based recipes. Green Kitchen – A delightful source of healthy and tasty vegetarian food. 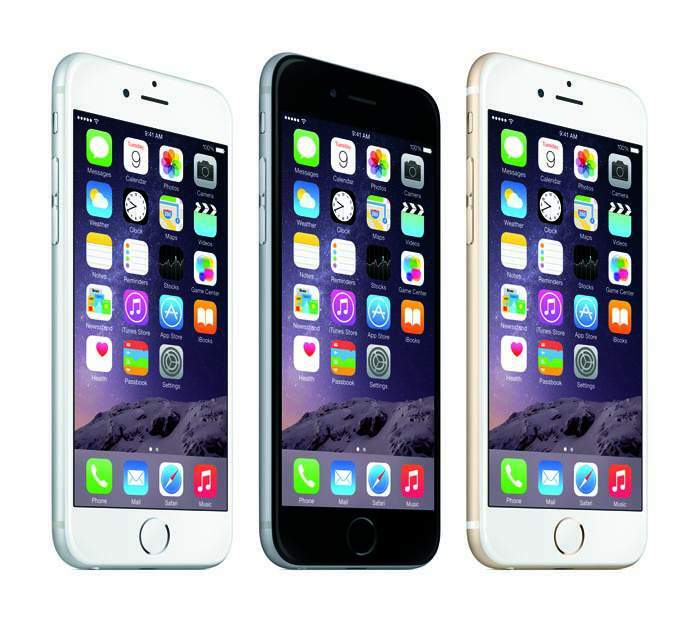 Smartphones have become more of a necessity than a luxury in this modern world. We carry our smartphones everywhere. We use it for doing almost every job of ours. The apps on our smartphone minimise our efforts and allow us to save time. Then why not use our smartphone for the purpose of learning the art of cooking and enter into the modern generation of the kitchen. If you often wonder how you can use your smartphone to manage your recipes but, don’t know how to do it, then you are at the right place. In this article, I will be guiding you to find out the best recipe app for iOS device. I will be listing down the Recipe Manager App for iOS devices. The list will include apps for non-vegetarians as well as pure vegetarians. These apps will not only help you to cook better but will also work as your recipe manager. Here are the Top 10 Best Recipe App for iOS device. 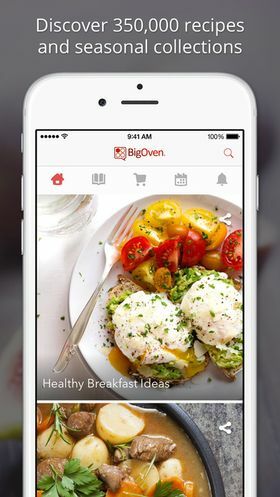 Big Oven is an app that makes the process of cooking as simple as possible. 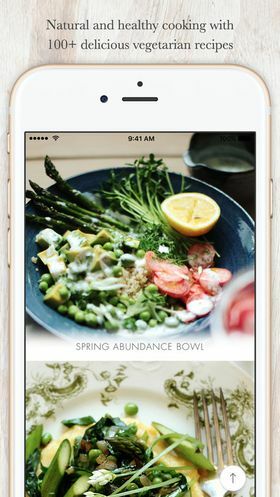 This cooking app will not only inspire you but will also help you to be organised. 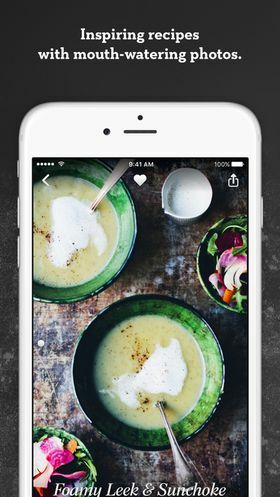 Its massive library of recipes makes this app unique and attractive. Big Oven gives you the ability to add snapshots of your recipes. The app also has features like creating a grocery list based on your selected recipe. It includes social features that allow you to share and check what your friends and family members are making. The app is free to download but includes in-app purchases. The app simplifies your cooking experience. This app can be used by the beginners as it features step by step guide for cooking better food. It features more than 2000 different recipes crafted by the top chefs and food bloggers. The most interesting feature of SideChef is its capability to adjust ingredients by your selected serving size. The social media feature of this app allows you to capture, share and upload pictures of the food on its network. 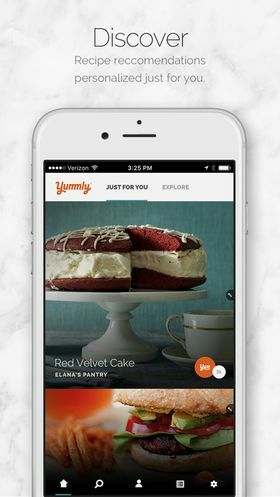 Yummly works as a search engine for all the cooking recipes submitted on the web. 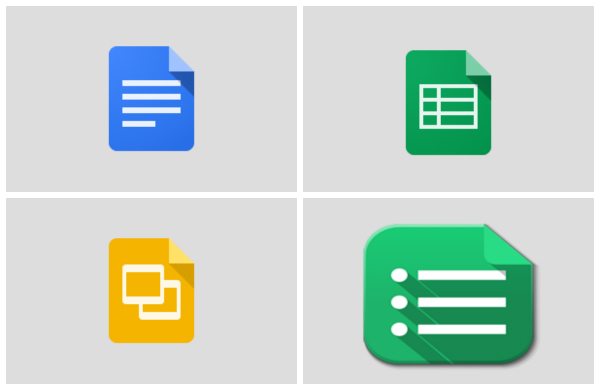 You can filter your searches to get what you want. The app features smart learning. It will learn what you like or dislike. It’s learning ability improves over time, and soon Yummly will start giving you perfect recommendation as per your food choice. The app also lets you shop your ingredients without switching to another 3rd party app. Yummly features instacart built in that will help you buy your perfect ingredients on the go and depending on your location it will deliver the ingredients within hours. Allrecipes offers you the recipes from the community of more than 30 million people around the globe. The app features not only text recipes but also the images along with reviews and ratings. 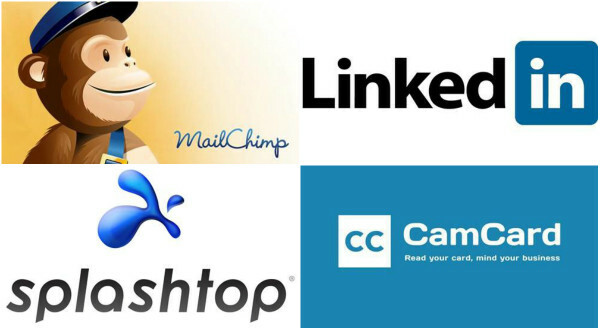 It’s huge network of individuals gives you more of a social feel than any other app. The app also saves some of your bucks by letting you know about the ingredients on sale and shows you the exact price to make any recipe on any given day. Apart from these mega features, Allrecipes Dinner Spinner also offers regular features like making the shopping list and saving your favourite recipe. It offers to filter your search results by cooking time, diet as well as food that you do not prefer. Epicurious offers a beautiful and user-friendly interface. The app is often regarded as the flagship cooking app since its release. It provides a database with more than 30,000 tested and rated recipes. This app works as the best recipe manager app for your iOS device. It also helps you to manage your shopping list across platforms. It includes features like hands-free commands that uses voice-recognition technology to take commands from your voice. 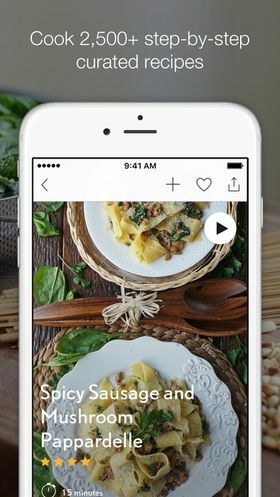 Editors of this app offer their recipes through this app, but it also includes recipes from various magazines. Epicurious can also be regarded as the best recipe organiser app. Cookpad is not an ordinary recipe app for iOS device. It is more like a social networking app for cooking enthusiastic people. 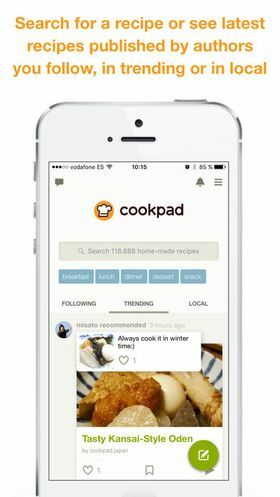 The app was formerly known as All the cook but now is renamed to Cookpad. It creates a virtual world of cooking around you and lets you share your recipes with your friends, family, and strangers. The app allows you to upload images of your prepared food so that people can comment on it. It lets you create your profile and also sorts your recipes into different categories. The profile enables you to upload and food shared by other people. Cookpad is available free for your iOS device. If you are the kind of people who love vegetarian food and other apps frustrate or disappoint you by offering you the recipes of non-veg food then, this app is made for you. It is a great app for vegetarians around the globe. My new root’s owner is a professional blogger named Sarah Britton. The app offers around 100 recipes which are of various types. It offers recipes for breakfast, lunch, and dinner as well. My new roots is a healthy choice if you love to be healthy because it offers nutritious, raw or gluten-free recipes. Other resource-full feature includes information on nutrition of the recipe that you choose. It also includes App exclusive recipes for grail-free meals. It comes with an integrated shopping list which lets you know what you need while shopping. The app costs $5. Everyone in this world wants to be healthy and fit, but they do not know the role of healthy food in making them healthy. 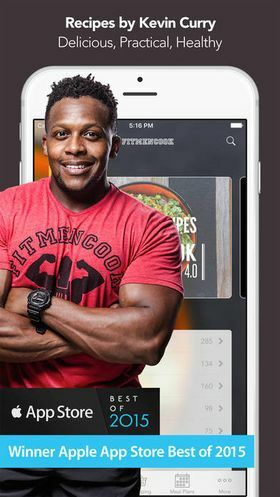 You might have heard the phrase “Our bodies builds in the kitchen.” Fit Men Cook is an app for the people who want to have balanced diet and stay healthy. It is not an app for just the cooking lovers, but it is more of a health-oriented app. The app offers recipes of several healthy but delicious meals. If you are a father or mother and wants to keep your family healthy, then this app will do wonders for you. Through social sharing feature of this app, you can easily share your recipe with your friends and family. 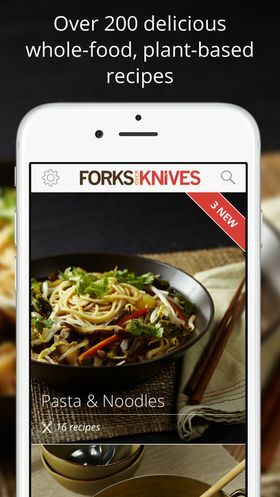 Forks Over Knives lets you explore over 300 recipes from the top chefs around the globe. The app is beginner-friendly and allows you to prepare your favourite meals with ease. Preparing a meal becomes very simple with this app as it offers step by step instructions for you. It works flawlessly with iCloud and lets you synchronise your shopping list with iCloud across multiple devices. It offers you tips for plant-based cooking along the contribution of over 20 leading chefs. You can download this app by paying $4.99 from iTunes. Green Kitchen is an app made with love for the pure vegetarians around the globe. It offers tasty and inspirational food with ingredients extracted from pure nature. Each recipe in the app comes with images and comments so that you can get the idea of how the prepared food tastes. It includes a mixed variety of main courses along with snacks and healthy drinks with over 135 premium recipes. The shopping list of this app has integration with your e-mail and iMessages which let you share your ingredients within your family. Social features let your friends know what you are cooking. Timer function of this app lets you know the exact time that you took to prepare any food item. You can download the app from iTunes by paying $3.99. The list contains all the main features of 10 best Recipe App for iOS device. These Cooking Apps will turn you into a master chef. Let your cooking hobby come into practice with the help of these apps. The links to apps are official links and are safe. We hope you have an enjoyable cooking experience.